Ahmad Taha is currently a PhD student in the Faculty of Engineering and Science of the University of Greenwich in the UK. He obtained a 1st class honours dual BSc degree in Electrical Communication and Electronics Systems Engineering from October University for Modern Sciences and Arts (MSA), in Egypt, and from the University of Greenwich in the UK in 2012. He was then appointed as a teaching assistant in MSA University and was granted a scholarship to pursue his MSc at the University of Greenwich in 2013. He finished his MSc in Embedded Systems with a distinction in 2014 and worked as an assistant lecturer at MSA University until April 2016. Ahmad has some hands on industrial experience from working in a private start-up company that he and a number of his colleagues started in 2014. The company’s main objective was to offer low cost embedded systems based solutions for educational, training and commercial purposes. Ahmad’s research interest is in energy management, Internet of things, and persuasive technology. Hospitals represent a busy environment with the majority of the medical operations relying on electricity, for example lighting and medical equipment. Hence, it is important to conserve it to ensure high quality of services, improve patients’ wellbeing as well as to the reduction of the hospitals’ carbon footprint and the impacts on the environment. The studies carried out in hospitals considered the use of renewable energy or the use of power efficient equipment to tackle the energy problem. The challenge remains open in how to tackle the energy problem in a hospital through behavioural change. This study represents a step into reducing electricity costs of Medway NHS Foundation Trust (MNFT) in the UK. The proposed idea is to use technology to persuade MNFT staff to monitor their behaviour and with the right motive, from selected and appointed energy delegates, sustain a pro-environmental behaviour. This paper describes the methodology and system proposed to reduce electricity costs in MNFT by inducing pro-environmental behaviour with the aid of technology. This involves a smart electricity metering system to collect and communicate energy data to a centralised server that pushes the data onto a dedicated web interface. Furthermore, addressing the psychological factors by appointing energy delegates to monitor the consumption, in selected areas, as well as motivate the staff members. In addition, monitoring human dynamics and analysing it against energy data to identify a relation between occupancy and electricity consumption trends in hospital wards. Hospitals are major consumers of electricity in the building sector. The fact that they operate 24 hours a day throughout the year results in a large demand of electricity to maintain the wellbeing of their patients (Gordo, Campos and Coelho 2011; Kolokotsa, Tsoutsos and Papantoniou 2012). Different researches considered conserving energy either by providing sources of renewable energy or by saving it, for example, using environment friendly or power efficient equipment similar to what (Gordo, Campos and Coelho 2011) discussed. Others like (Fischer 2008; Emeakaroha et al. 2014b) studied how behavioural change can reduce environmental risks and costs in different types of buildings. The human behaviour is responsible for positive and negative consequences resulting from different actions taken in different domains/sectors around the society. It is usually up until a certain age where a human is dependent on his/her guardian. However, there comes a point where everyone is responsible for controlling and evaluating his/her actions. Thereby it is important, as individuals in a society, to always bear in mind the consequences of any actions taken to ensure development and progression. With focus on the energy domain, the increase in human population resulted in an increase in needs, and with electricity being a major powering source it’s important to utilise it efficiently without waste. Electricity contributes to our society on both social and economic levels (Teke and Timur 2014). However, the use of it impacted the environment in a negative way and wasting it would also mean wasting money. Thereby, it is important to keep an eye on the usage to save costs, reduce carbon emission and have a greener environment. The UK, and similarly the world, suffered from the uncontrolled consumption of electricity as well as other sources of energy in all sectors of the society. The challenge remains and has not been resolved until this point (Emeakaroha, Ang and Yan 2012). This research studies human behaviour as an important factor in electricity consumption and how can individuals be psychologically motivated to build and sustain a pro-environmental behaviour in MNFT. Studies were carried out in dormitories and public dwellings aiming to find the best way to get consumers to consider the consequences of their actions on costs and the environment. Thus, performing this in hospitals remains an ongoing challenge. Researchers concluded that the invisibility of energy data demotivates individuals (Darby 2001, 2006). Visibility, in this context, is the provision of feedback on electricity consumption at a known frequency. The availability of the consumption data along with proper motivation can help induce pro-environmental behaviour and by monitoring it, sustain such behaviour. This research aims at reducing the electricity costs of MNFT in the UK. The initiative came in response to the high spendings on utilities that exceeded £750,000,000 each year in the UK with nearly 20% being wasted energy according to (Green Investment Bank 2014). The idea is to use technology to persuade MNFT staff to monitor their behaviour and with the right motive, from selected and appointed energy delegates, sustain a pro-environmental behaviour. This paper proposes a methodology to reduce electricity costs in MNFT by inducing pro-environmental behaviour with the aid of technology. The proposed methodology involves a survey to collect MNFT staff behavioural and energy awareness data. Moreover, a smart electricity metering system to collect and communicate energy data to a centralised server that pushes the data onto a dedicated web interface. Furthermore, appointing energy delegates, in each ward/area of the hospital, to monitor the consumption as well as motivate the staff members. In addition, monitoring human dynamics using new technology, such as Radio Frequency Identification (RFID), and analysing it against energy data. The study would include a baseline data collection period, for reference, followed by an experimental period to test and evaluate the system. A post experimental survey was designed to evaluate the system as well as the hospital staff performance upon completion of the experimental/intervention period. The building sector is active when it comes to energy consumption. The fact that buildings are what host/accommodate all different human activities gives them a big share of the total energy consumption. According to (Gordo, Campos and Coelho 2011), buildings account for 40% of the energy consumed in the European Union. Another study (Teke and Timur 2014), highlighted that it represents 34% of the world total energy consumption. Hence, it is important to study it and find solutions to reduce consumption and improve the carbon footprint. Various researchers considered different techniques to address this matter in the building sector. Some of the techniques addressed it through motivation and behavioural change while others addressed non-human related aspects such as modernising equipment. Technology had a role in the proposed/implemented techniques. Some studies involved the use of a web interface (Emeakaroha, Ang and Yan 2012), displays (Abdelmohsen and Yi-Luen Do 2008), social networks (Mankoff et al. 2010), the use of information and communication technology (ICT) (Mattern, Staake and Weiss 2010) and others. This section elaborates on those approaches to provide an overview of what has been considered and what has been achieved when it comes to conservation in the building sector. The following two subsections highlight the approaches taken in a hospital environment along with residential buildings, respectively. It was important to primarily investigate the techniques used to reduce electricity/energy consumption in hospitals since this paper contributes to the research currently undertaken in MNFT. A study was carried out in a public Portuguese hospital to identify and evaluate several energy saving measures (Gordo, Campos and Coelho 2011). The authors argued that controlling the indoor climate of a hospital constructs the major requirement of its energy management plan with emphasis on lighting, hot water and heating. The proposed energy saving measures were applied to lifts, lighting, chillers and building envelopes to address the energy saving problems while considering controlling the indoor climate. This involved modernising lifts by equipping them with electronic speed variation controllers and traffic management systems. Aside from the lifts, replacing chillers that were more than 15 years old with new chillers that had higher Coefficient of Performance (COP), hence more energy efficient. Moreover, replacing all the light bulbs with ones that are less electricity consuming along with the installation of motion sensors to ensure proper utilisation of the lighting. Finally, fitting double glazed windows to keep the effect of the external weather conditions to the minimum. The evaluations performed by the authors on the new upgrades were based on cost, payback period and, where applicable, electrical ratings. (Kolokotsa, Tsoutsos and Papantoniou 2012) identified the state of the art technologies for energy efficiency in hospital buildings. The aim was to show that simple energy saving measures can save up to 10% of the primary energy consumption. The authors reviewed various work by researchers, each introducing different energy saving measures. Four major energy flows were identified: heating, electricity, compressed air and cooling. Each of them contributes to the hospital but each also has an impact on energy consumption. Hence, it was important to contemplate what can keep this impact to the minimum. The review performed by the authors included electricity saving measures such as installation of energy efficient electric motors or the use of LED lighting. Others considered systems like combined heat and power (CHP), an aquifer thermal energy storage (ATES), fuel cells, photovoltaic based systems, solar thermal and solar cooling systems. All of which can reduce energy consumption. However, the high cost of installing such systems is what makes it difficult and time consuming for hospitals to take a decision to approve and implement any of them. Aside from going to the major cause of the energy consumption, the review also discussed the use of information and communication technology (ICT) in energy management. This included, but was not limited to, the use of Artificial Intelligence (AI) and the use of building energy information systems (BEIS). The vast advancements in technology and its role in various domains/sectors have made it crucial to consider it as a solution for energy management in hospital buildings. The authors included in their review numerous case studies on hospitals in different places around the world. Three of the case studies are listed in this section and they involved hospitals in Mexico, Poland and Italy. The first discussed the introduction of pinch technology to reduce energy consumption. Pinch technology is based on pinch analysis and is a method for energy reduction through the introduction of thermodynamically based methods. In the second case study, which involved two Polish hospitals, the seasonal changes in the heat consumed to produce hot water were monitored and analysed. The results of the analysis were useful as they allowed for the likelihood of using renewable energy sources such as solar heating. The third and final study, discussed in this subsection, was carried out in an Italian hospital where the researchers studied the effect of using fuel cells on electricity consumption. The results revealed the capability of the fuel cells to cover 86% of the required amount of electricity. Another study that involved an Italian hospital in Naples was carried out by (Buonomano et al. 2014). The aim was to investigate several proposed strategies that were selected by the hospitals’ managers/directors to improve the energy performance. Four strategies were proposed and analysed to choose the best approach that would reach the required target without exceeding the budget allocated for implementation. A building and an economic model were built for the hospital to decide on one of the proposed strategies. Each of the strategies were analysed for annual operating cost savings, energy demand, seasonal thermal comfort indexes and simple payback period (SPB). Other researchers such as (Bizzarri and Morini 2006; Renedo et al. 2006; Saidur et al. 2010; Vanhoudt et al. 2011; Teke and Timur 2014) reviewed similar approaches to achieve energy savings in a hospital environment. The focus of most of them was on heating, ventilation and air conditioning (HVAC). A few looked at lighting and other electrical related measures. The measures introduced so far were focused on energy efficiency of equipment or medical devices without mentioning the role or impact of the user doctor/nurse/patient. Thereby, achieving energy efficiency through persuading pro-environmental behaviour in a hospital environment remains an ongoing challenge. Most of the literature around the use of feedback technology to reduce energy consumption was focused in residential buildings. Researchers reviewed and experimented various forms of feedback and its effect on behaviour towards consumption. This section presents an overview of different approaches considered by researchers to motivate pro-environmental behaviour using feedback. For instance, (Petersen et al. 2007; Bekker et al. 2010; Emeakaroha et al. 2014a, 2014b) experimented the effect of feedback on energy savings in University halls of residence. Each carried out an intervention to measure the effectiveness of the approach taken. Emeakaroha and Petersen examined the effect of web based feedback technology on the behaviour of the University of Kent and Oberlin college student residents respectively. In both of their studies, energy data (baseline data) was collected prior to the interventions and used for reference. Emeakaroha aimed at witnessing the effectiveness of combining feedback technology with energy delegates on electricity savings. A delegates’ role was to teach, motivate and alert the students using data displayed on the website. The study involved an intervention in which an experimental group, under a set of conditions, was investigated against a control group under a different set of conditions. The experimental group was provided with the combined effect of feedback and energy delegates while the control group received feedback with weekly email alerts aside from access to the online feedback system. The results were analysed on several levels to accurately identify which of the periods and in which group were the most savings achieved. Maximum savings, of 37%, were scored by the experimental group due to the combined effect of real-time feedback and energy delegates. To examine the sustainability of the impact on the students’ behaviour, feedback was removed, and energy delegates were released from their duties after the completion of the intervention period. Reductions were still achieved; however, the rates were less if compared to the intervention period. This highlights the importance of the proposed combination to sustain the required behaviour. On the other hand, Petersen was more focused on the effect of various resolutions of feedback on the behaviour of the residents. The author relied on the competition factor to motivate the students. A two-week competition was made between the “High Resolution Dormitories” group and the “Low Resolution Dormitories” group. The “High-resolution Dormitories” group received daily feedback on electricity and water consumption through the designed website and the “Low-resolution Dormitories” group were given feedback once per week. It was mentioned that the overall savings recorded reached 32% with the higher part of the savings recorded by the “High-resolution Dormitories” group. The study conducted by Bekker aimed at investigating the effect of combining daily feedback, visual prompts and incentives on electricity consumption of two University halls in New Zealand. The tools used were different compared to the previously discussed interventions. However, the experiment setup was similar as two groups were formed one acting as a control and the other as an intervention/experimental group. The intervention group was provided with daily feedback on their electricity consumption by displaying the achieved savings on a white board. Large posters were used to provide the residents with information on the rewards along with drawing their attention to the energy savings thermometer displayed on the white board. The visual prompts comprised of small notices used to educate the residents and spread awareness. The intervention group recorded more savings compared to the control group which could have been increased with more efficient representation of the feedback data. Another study conducted by (Lin et al. 2016) investigated the effect of cultural differences on the effectiveness of an eco-feedback system on energy consumption behaviour. The study involved four buildings of a University dormitory in China, three of which were occupied by Chinese students while the fourth was taken by international students. A seven-week intervention period started following a six-week baseline period that started before recruitment and involved recording daily consumption data. Similar to previously described experimental setups, the intervention involved control as well as experimental groups. A web interface was used to provide the students with data on the consumption of all buildings in the intervention, hence providing them room for competition and comparison to motivate them to conserve. The experimental groups were provided with access to feedback on consumption through a web interface along with weekly emails reminding them to log on and check their consumption. The use of emails as a reminder to check consumption is not considered to be the most efficient way to utilise the feature and the students time. With students, it is important to utilise the time they spend on an activity to the maximum. The time taken to open a reminder email could have been better utilised if consumption data or status were pushed in the same email. The Chinese students in the intervention group managed to reduce their consumption by 16.7% while the international students increased their consumption by 23.7%. The author explained this large difference in the results by indicating that international students had their universities pay for their bills, hence a behavioural problem. Several factors may have contributed to the results obtained; firstly, it was not mentioned when did the internationals start their study, time taken to settle down and get used to the new environment is important. Secondly, if the students were on an exchange program lasting for a month or two then their behaviour is more likely to be different compared to students who are committed to a larger study period. The authors concluded that culture had an impact on the effectiveness of the system. Being a possible factor, the study time and the samples chosen were not seen to be sufficient to draw such conclusion. Moreover, sustainability was not discussed as the focus was to examine the cultural differences. In public residential buildings, the researchers intensively reviewed various studies and interventions that aimed at identifying what forms an effective feedback. Various forms of feedback were discussed by (Darby 2001) with emphasis on the effectiveness of direct feedback compared to other types of feedback such as indirect ones. Direct feedback has shown more effectiveness compared to other types according to the literature. It is important to identify what form will match set the environment/audience that feedback is being given to. In other words, identify the energy culture. Feedback is given to notify, alert and teach users about their energy consumption. Hence, for it to do this, it needs to be put in a comfortable and effective form. On a different level, (Fischer 2008; Froehlich 2009) discussed what constructs a good feedback. It was highlighted throughout the reviewed studies that frequency, display units, content, duration, mode of presentation and other factors should be considered to obtain a working feedback system. Froehlich, J. identified them as the “ten design dimensions of feedback technology” which were illustrated and supported by several studies on in-home energy usage. 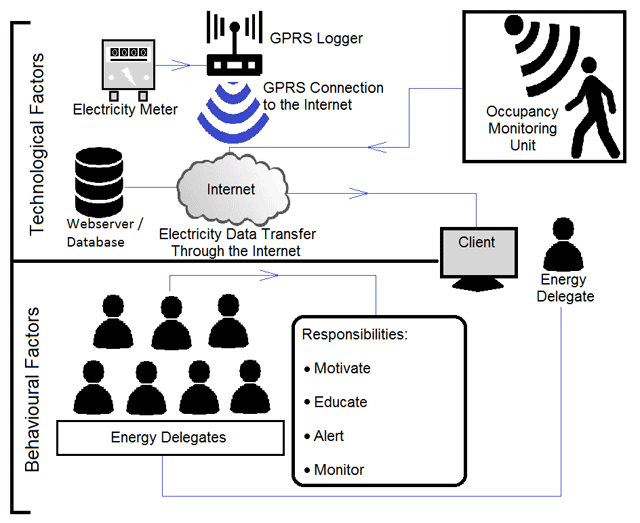 The main aim was to outline the role Human-Computer Interaction (HCI) can play in in-home energy usage and feedback systems. Results have shown that in-home feedback technology can achieve 10–15% reduction in energy use. However, sustainability of the effects remained a challenge. Apart from that, other researchers focused their review on what best motivates and encourages people to reduce their consumption. For instance, (Abrahamse et al. 2005) discussed several behavioural determinants such as commitment, goal setting, and others, alongside the use of consequences, whether positive or negative, to influence pro-environmental behaviour. Moreover, the use of displays (Vanhouwelingen and Vanraaij 1989; Wood and Newborough 2006; Abdelmohsen and Yi-Luen Do 2008), smart meters, and other forms of new technology was reviewed with focus on how it could be used to influence behaviour (Darby 2006; Wood and Newborough 2006). With all this literature in place and with the different types and forms of feedback that were discussed. It was important to consider where and to whom this feedback was provided and to tailor it, while considering all the previously mentioned factors, to suit the consumers and get the most out of their behaviour. The findings from the literature, presented in the previous two sections, indicated several successful measures to reduce energy in the building sector. However, with emphasis on hospitals, the measures presented ruled out the human factor and focused on improving the energy efficiency of equipment and HVAC systems. This paper addresses the human factor in NHS hospitals by investigating the impact of feedback technology on their pro-environmental behaviour. This has been looked at in different domains of the building sector but remains a challenge when it comes to hospitals. The way a hospital operates forces staff to focus mainly on patient’s wellbeing and neglect all other aspects. Various researches conducted on residential buildings, investigated and demonstrated the effectiveness of feedback on behaviour and how savings were achieved. However, the results showed the impact during the intervention period and did not show how such behaviours were to be sustained. Hence, the question remains, can the introduction of electronic web-based feedback and spreading awareness induce pro-environmental behaviour in an NHS hospital and reduce electricity costs? This paper hypothesises that continuous provision of informative and meaningful digital feedback while motivating hospital staff has the capability of creating a behavioural pattern that could eventually turn into a habit. Hence, sustaining a pro-environmental behaviour. This section overviews the proposed methodology and system architecture to reduce energy costs in MNFT, using persuasive technology, by inducing pro-environmental behaviour. Persuasive technology is that used to change the behaviour of users/consumers by influencing and persuading them (Fogg 2003). With the major aim being inducing pro-environmental behaviour using technology, the architecture was designed based on technological and behavioural factors, this is shown in Figure 1. A diagram presenting the system architecture and the associated technological and behavioural factors. The following subsections elaborate on each of the factors associated with the proposed system architecture. The first focuses on the technological part of the approach whereas the second discusses the behavioural factors and aspects considered. Technology nowadays plays a crucial role in various sectors of the society (Ramey 2012; Sasvari 2012). Technology contributes to data storage, processing and communication. Nowadays with the advancement in various technological fields, including but not limited to Internet of Things (IoT) (Minerva, Biru and Rotondi 2015), communication over the internet is the present and future. Communication in this essence refers to communicating electricity data to MNFT staff. Technology in this system is divided into two branches, feedback on electricity data and occupancy monitoring. However, both would be designed to report and contribute to the same web interface which represents the key tool to inducing pro-environmental behaviour (Emeakaroha et al. 2014b). Described in the following paragraphs are the two technological branches of the system, starting with feedback on electricity data and secondly monitoring occupancy in MNFT. Darby (2006) highlighted that smart metering and provision of more information to consumers could help reduce household consumption. Electricity consumption data, provided through the smart metering system that logs the data onto a dedicated web interface, represents the driver of the proposed system. The data comes from electricity meters that were and remain parts of MNFT’s electrical infrastructure. The feedback data is directed to MNFT staff to provide them with information on their consumption. However, it is also intended to be accessed by energy delegates whose main responsibility lie in continuously motivating MNFT staff to change their behaviour and keep an eye on their consumption. The aim of the web interface is to visualise consumption and get people to engage with electricity data which would enable them to teach themselves about energy conservation and pro-environmental behaviour (Darby 2001). This is intended to further broaden their understanding of the relation between their actions and the resulting impacts. The upper part of Figure 1 shows a simple representation of the main items involved in forming the technological part of the proposed system as well as the flow of the process. 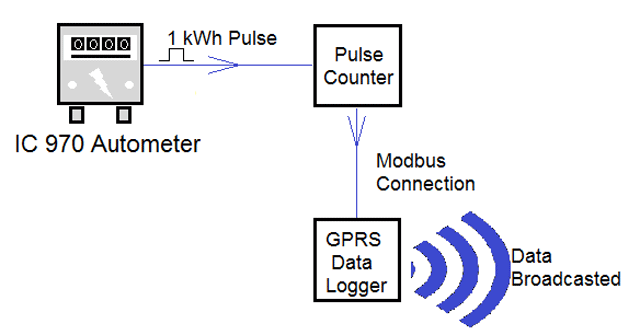 The electricity meters provide consumption readings to the GPRS logger which in turn puts the data in a form that could then be broadcasted through a wireless GPRS link. The data is stored in a server that pushes the data onto a secure website for processing, storage and display, every half hour, on the client terminal. Being a website, it could be easily accessed from anywhere and via any device that supports internet browsing. The advancements in technology and the spread of smart phones would ease the process of accessing the data. With most of MNFT staff having access to computers or notebooks, feedback on electricity would be handy and easily accessed by everyone working in the hospital. Electricity, and even generally energy, consumption is directly related to the actions taken by human beings (Batra et al. 2013). In a hospital, this could mean usage of equipment, heating, water and so on. This implies that energy consumption in a specific area could be a function of the physical presence of human beings, referred to as occupancy, in this same area. However, not through a linear relationship as a study carried out by (Yohanis et al. 2008) has shown that the electricity consumption per person decreases as the occupants in an area increase. Thereby, it was important to consider dragging occupancy as part of the energy study carried out in MNFT. The effect of occupancy could be due to, but is not limited to, increased temperature resulting from the number of humans in an area or could mean an increased possibility of equipment usage, whether medical or non-medical. As part of the technological factors of the proposed system, occupancy monitoring plays a crucial role in designing a robust system to induce pro-environmental behaviour among MNFT staff. Occupancy data would be analysed against energy consumption data to draw an understanding of the relation between them. The proposed method to achieve this, as seen in Figure 1, was to use the occupancy monitoring unit to provide occupancy information about different wards/areas of the hospital. This would then be analysed against the energy data provided by the electricity feedback system. The responsibility of the occupancy monitoring unit lies in counting the number of people in a ward/area of the hospital using sensor technology. Moreover, logging the data onto a centralised webserver for analysis against the electricity data to understand consumption trends in different areas of the hospital. While this has no direct influence on staff’s behaviour, understanding consumption trends through occupancy data alongside the monitored consumption will help identify potential savings. For instance, two identical wards, one consuming more than the other although it has less patients admitted to it would alarm the hospital for possible waste of energy in this specific ward. Behaviour is a habit that a person gets used to practising upon learning it from a source, that could be family, surrounding environment and so on. To possess positive behaviour, it is important to teach what is it like to have one to various individuals in the society. However, teaching alone would not be as effective as it would be if combined with knowledge of what went right or wrong because of the current behaviour. This was introduced in the proposed system through provision of feedback via the web interface and by appointing energy delegates. The main driver for motivating MNFT staff is feedback on electricity data provided on two different levels. The first being through the web interface available to everyone to monitor the consumption and the second by the appointed energy delegates. The delegates would use the electricity data to motivate their staff through goal setting and education along with alerting them when necessary. The role of energy delegates does not only include monitoring and motivating others, but also to monitor and motivate themselves. The energy delegates represent the key for sustainability of the targeted pro-environmental behaviour in MNFT. As seen in Figure 1, the “Client”, which represents the feedback on consumption, is shared between the technological and behavioural factors as it contributes to both. It represents the technology and is used to induce behaviour. Moreover, the behavioural part would include campaigns, and other sustainability activities to spread awareness and keep the staff as close as possible to the energy management plan. This would ensure that they practice positive and green behaviour and hence embed it in their daily habits. The following paragraph describes the energy survey designed to circulate MNFT and collect energy awareness and behaviour data. The proposed survey aimed at collecting behavioural data and measure energy awareness of MNFT staff. The survey was designed in the form of a questionnaire to tell how aware people are of energy and its general impact. Moreover, identify what could motivate them to practice energy saving measures and what measures do they apply if they already practice it. Whether they find themselves green and aware was also sought when designing and structuring the questionnaire. It is important to know who the target consumers are to increase the efficiency and robustness of the system. The questionnaire was designed to provide information that would assist with putting a robust system together aiming at inducing pro-environmental behaviour in MNFT. The questionnaire results will help set a plan to spread awareness and educate MNFT staff on energy usage and conservation as it will indicate what is known and what is not. Since the major role of an energy delegate is to motivate individuals in the hospital, data from the questionnaires will help set their roles and identify action plans. It will also provide information on their data representation preferences to get maximum motivation. For instance, in what form would they prefer to see the electricity data. The questionnaire was developed using an online statistical tool called Qualtrics. The tool allows for developing and distributing the questionnaire electronically as well as collecting the responses automatically upon completion of the survey by the participant. This ensured that the process remains organised and reduced the possibility of losing or confusing responses. The questionnaire was ethically approved by the Health Research Authority (HRA), application reference number IRAS 219232. Figure 2 shows a screenshot of a question from the questionnaire taken from Qualtrics, the online statistical tool. A screenshot showing part of the questionnaire as viewed by the survey participants. As seen in Figure 2, some questions were designed to prompt participants to add their own views to provide ideas that could benefit the study and the research. Moreover, this would also encourage them to think about the purpose of the study and increase their awareness which in turn would contribute to the hospital’s energy savings. Having discussed the technological and behavioural factors represented in Figure 1, this section summarises and emphasises on the methodology to highlight the model designed to achieve the previously mentioned aim. The feedback system presented as part of Figure 1 was designed to monitor data in one of Medway hospital’s substations, home for the electricity meters of one of the hospital’s blocks. 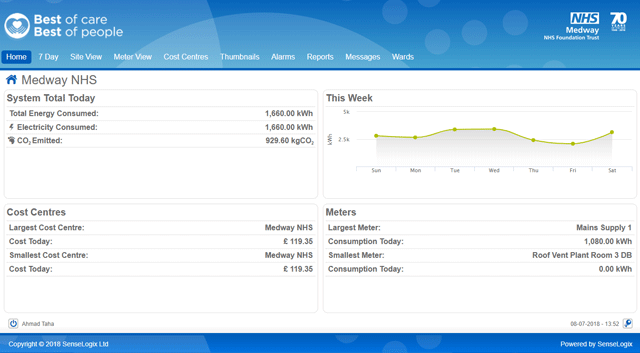 The currently installed feedback system processes and pushes electricity pulses to a centralised webserver, this is shown in Figure 3, where the data is logged every hour and can be viewed every half-hour on the web interface. A diagram showing the flow of the data from the meters until they are broadcasted. Staff engagement is crucial for the effectiveness of the implemented feedback system. The web interface was designed to display data in different forms, that is kWh, £ and kgCO2, and resolutions, that is half-hourly, daily, weekly and so on. Figure 4 shows a screenshot from the website that is to be launched to Medway hospital wards, this is the primary design and is not the final version that will be officially launched. All users within a single ward will be able to view their ward’s current and historical consumption data through fixed screens that will be placed for the sole purpose of displaying the energy data. The main dashboard will display current as well as previous consumption along side comparison against other wards to influence users by creating a healthy competitive environment. A screenshot showing the dashboard, as viewed from an admin account, that is to be displayed on PC screens in the hospital wards. The feedback system will be introduced to selected wards as part of a pilot study for data collection through an experimental intervention. It will be made available to the wards for one month and appointed delegates or energy champions will be selected from the wards to act as a second layer of motivation to the ward’s staff in the following month. This will provide an understanding of the impact of the feedback as well as feedback combined with an energy delegate. This section presents a complete picture of the proposed methodology to reduce electricity costs in MNFT by inducing pro-environmental behaviour with the aid of technology. This is shown in a form like that of a timeline to clearly indicate the flow order of the system and the tasks involved. The proposed methodology comprises of six stages, with some stages depending on others. Stage 1, in Figure 5, represents the installation of the smart metering system that is the feedback tool, described earlier in the “Technological Factors” section. With the feedback system in place, stage 4 in Figure 5, the baseline data collection period can commence. The purpose of this period is to collect electricity data, under normal operating conditions, to identify the average consumption made by each ward/area in the hospital. The collected data would then be used to set a consumption threshold for each ward in the hospital. In other words, set their target consumption. This stage is scheduled to happen without knowledge of anyone but the hospitals’ energy team to ensure data integrity. Parallel to the stages marked 1 and 4, on Figure 5, come stages 2 and 3 which are setting up the occupancy monitoring system and conducting the pro-environmental behaviour survey. The commencement of those stages does not rely on anything else; however, stage 5 can only start after they end. The stage marked 5, on Figure 5, represents the actual experiment which would involve three main sub stages. Firstly, provision of feedback on electricity to all MNFT staff, along with collecting occupancy data and finally appointing energy delegates to practice their motivation role. The baseline period is scheduled to be between three and six months with the experiment lasting between nine and 12 months. Following the intervention period, a post-experimental survey will be broadcasted throughout the hospital to evaluate the system as well as MNFT staff performance. Figure 5 shows a brief representation of the planned implementation and flow of the system. The arrows were used to identify tasks that are predecessors to others, similar to the representation of tasks in a Gantt chart or a project plan. Proposed System Flow indicating the various stages involved to undertake this research. 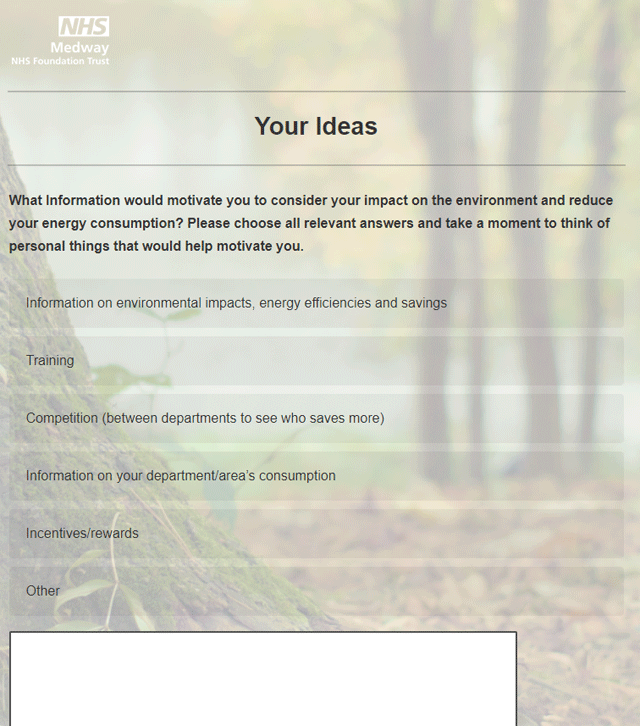 This paper proposed a methodology to reduce electricity costs in Medway NHS Foundation Trust, in the UK, by inducing pro-environmental behaviour using persuasive technology. The implementation of the previously presented energy metering and monitoring system has the potential of typical savings between 8% and 15% as per some energy monitoring equipment suppliers. After consideration of consumer engagement, an extra 5% savings can be achieved with the continuous support of the appointed energy delegates. The reviewed and presented literature has shown the open gap between technology and human psychology in energy management of hospitals. Furthermore, it highlighted through studies and interventions, the effectiveness of feedback on energy consumption and consumer behaviour in different types of residential buildings. However, the sustainability of the impacts/savings made was not clear. This is believed to have resulted from lacking a permanent system which ensures continuous motivation and feedback provision. The system proposed for implementation in MNFT was designed to achieve the required pro-environmental behaviour and reduce the costs on electricity bills. The availability of the smart metering system as part of the hospitals’ infrastructure would ensure continuous provision of feedback on electricity consumption to the hospitals’ staff. Hence, the feedback as a motivator would be a permanent part of the system. Moreover, the data collected from the survey would assist in spreading awareness and educating MNFT staff on energy usage and conservation. This would contribute to the effectiveness and sustainability of the system. Apart from the effect of feedback on staff behaviour, the assignment of the delegates’ role to ward managers and similar positions will ensure staff motivation and behavioural change. This will eventually be enrolled in job descriptions and become part of the recruitment process. Hence, embedding it with other clinical and nonclinical roles and highlighting the importance of it in the hospital. It is believed that the key to sustainability of MNFT staff pro-environmental behaviour is to ensure the continuous availability of feedback data and motivation factors. Having completed the design, the anticipated next step would be commencing with the implementation which was briefly described in the “System Flow” subsection and shown in Figure 5. Upon commencing with the stages described earlier, evaluation will be made to each of them to ensure maximum efficiency. Evaluation includes, unit testing, integration testing, validation of collected data and feedback from the users. Furthermore, extra features will be added to the system. This includes, but is not limited to, enhancements to the web interface, designing a mobile application that would provide feedback and alerts. Moreover, creating energy campaigns to support the delegates’ role by spreading awareness and motivating individuals. A. Taha would like to express gratitude to Jessica Brown, Energy and sustainability officer of Medway NHS Foundation Trust, for her support provided to the research as a whole. He would also like to express gratitude to the University of Greenwich for the Vice Chancellor studentship that funds and supports this research. Abdelmohsen, S and Yi-Luen Do, E. 2008. Energy Puppet: An Ambient Awareness Interface for Home Energy Consumption. In: 7th International Workshop on Social Intelligence Design, 3–9. San Juan, Puerto Rico. Darby, S. 2006. The Effectiveness of Feedback on Energy Consumption. Environmental Change Institute University of Oxford, Oxford. Fogg, BJ. 2003. Persuasive technology: using computers to change what we think and do. San Francisco, USA: Morgan Kaufmann Publishers. Froehlich, J. 2009. Promoting Energy Efficient Behaviors in the Home through Feedback: The Role of Human-Computer Interaction. Proc. HCIC Workshop, 4. Gordo, E, Campos, A and Coelho, D. 2011. Energy Efficiency in a Hospital Building Case Study: Hospitais da Universidade de Coimbra. In: Proceedings of the 2011 3rd International Youth Conference on Energetics (IYCE), 1–6. Leiria, Portugal. Green Investment Bank. 2014. A healthy saving: energy efficiency and the NHS. Available at: http://www.greeninvestmentbank.com/media/5242/gib-nhs-market-report-final.pdf [Accessed 13 June 2016]. Lin, J, et al. 2016. The Impact of Eco-Feedback on Energy Consumption Behavior: A Cross-Cultural Study. In: Proceedings of the 2016 33rd International Symposium on Automation and Robotics in Construction, 274–281. Auburn, USA. Mankoff, J, et al. 2010. StepGreen.org: Increasing Energy Saving Behaviors via Social Networks. In: Fourth International AAAI Conference on Weblogs and Social Media, 106–113. Washington, USA. Minerva, R, Biru, A and Rotondi, D. 2015. Towards a Definition of the Internet of Things (IoT), 1–86. Ramey, K. 2012. Technology And Society – Impact of Technology On Society. Available at: http://www.useoftechnology.com/technology-society-impact-technology-society/ [Accessed 8 May 2017]. Sasvari, P. 2012. The Effects of Technology and Innovation on Society. Bahria University Journal of Information & Communication Technology, 5(1): 10. Teke, A and Timur, O. 2014. Overview of Energy Savings and Efficiency Strategies at the Hospitals. International Journal of Social, Behavioral, Educational, Economic, Business and Industrial Engineering, 8(1): 242–248.